Hey guys! This is the first time I try one of the saran wrap techniques. I’m planning on testing the others too! 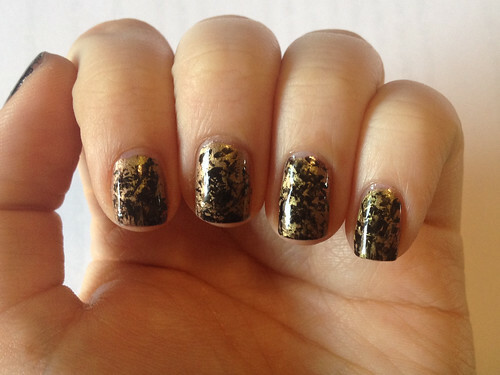 For this one I painted my nails with two layers of gold nail polish. Then I took a piece of saran wrap and made it into a ball. I put some black polish on a thick piece of paper/plastic and press the saran wrap into it. Then I press a few times on the paper with the saran wrap, because otherwise you will get to much nail polish on your nails. 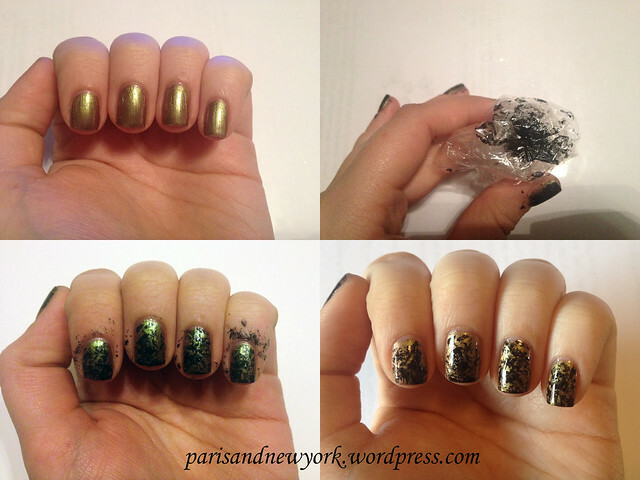 After that, press it on your nails, clean the rest with nail polish remover and add a top coat. I like this colour combination a lot for parties! Looks great, would like to try this technique too! Absolutely ADORE this effect and I’m going to have to give it a shot myself. Thankyou for sharing!